The schedule for the immediate future is published in the Diocesan Magazine Fides. For more current information, please consult our Calendar page. The general Mass Schedule with information about weekday Masses can be found here. Please also consult our Calendar - translations into English are usually available when you click a calendar event. Rosary on Wednesdays and Adoration on Fridays from September through May. No diaspora Masses in June, July or August. No church coffee on Sundays during the summer, instead coffee is served after Evening Mass on Wednesdays. Mon, Wed, Fri 18.00 Mass; Tue, Thu 7.30 Mass; Wed 17.30 Rosary (Sept-May); Fri 17.30 Adoration of the Blessed Sacrament; Wed, Sat 19.30 Liturgy of the Neocatechumenal Way. Confession: Sat 17.00-17.45; from 17.30 before Weekday Eveneing Masses; before Sunday Masses; by appointment. Are you new in the area? Or did you only recently become Catholic? Do you want to take an active part in the life of our Church? There is a group of volunteers who would like to help you find your way and feel at home in the Church. We are based at the Studium Catholicum in Helsinki, working in close collaboration with the parish priests. You will find us at the Church Coffee after the 9.45 Mass on Sundays. You can ask us for any information you need. Ask for Lucia Indren (040 414 5861) and the other members of the Welcoming Team! Or just come to one of our gatherings at the Studium Catholicum! Click here for details. We pray the rosary on Wednesdays and there is Adoration on Fridays from September through May. The Cathedral gardens and the Statue of Our Lady in June. 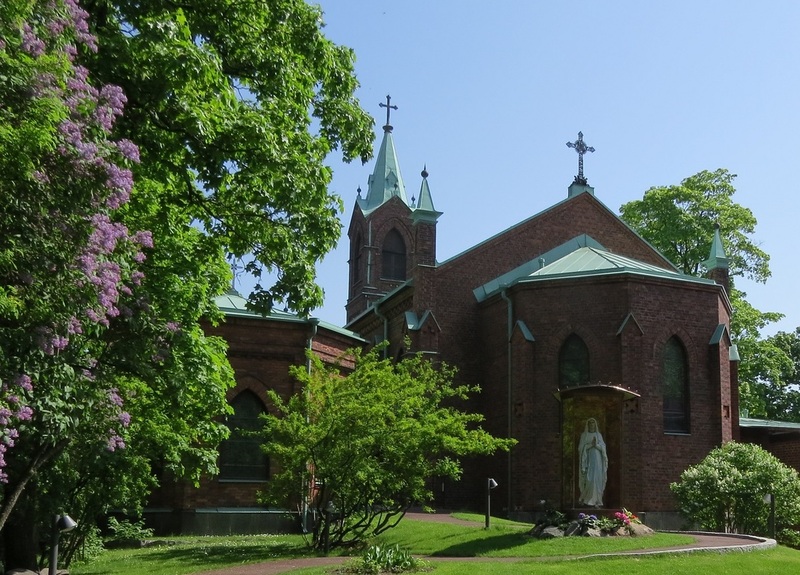 On the second and fourth Sundays of the month, Mass is celebrated at 11.00 a.m. in the Lutheran Church in Tapanila (Veljestentie 6, Helsinki). Please note that there are no more Masses in Tikkurila. Diaspora Masses are Masses celebrated in other places than the Diocese’s own churches. ​Mass in Polish is no longer celebrated in St Henry's Cathedral. Instead, a Polish Mass is available every Sunday at St Mary's. Mass in Spanish is celebrated in the cathedral on the first Sunday of the month at 4.30 p.m.